The internet's top guide to the sandwiches I've eaten. 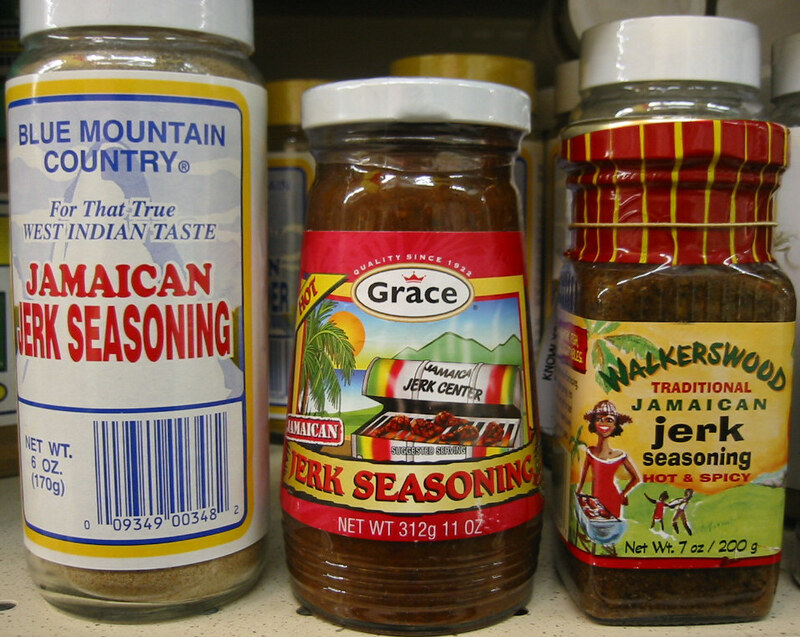 Via Wikipedia "Jamaican jerk seasoning". At my local C Town deli counter, I was pondering what to get for my weekly cold cuts. I was the only person around, so the deli guy immediately asked what I wanted. In a panic, I blurted out, "Buffalo Chicken! No! Ummmmm ... [frantically panning the meat case] uh, Jerk Turkey!" He sliced it up and I was on my way. Now, I know next to nothing about what's in Jerk seasoning. I think it's Jamaican, and my understanding was that it had something like a mild curry flavor. In the case of Boar's Head's Jerk Turkey, it's apparently a chile-heavy dry rub. The heat blast was a shock when I bit into my lunchtime turkey sandwich. Boar's Head makes some tasty spiced meats. Their Salsalito Turkey and Blazin' Buffalo Chicken come to mind. Neither of those are as hot as the Jerk Turkey. So it made my brown bag lunch a lot more intense than I was expecting. I usually have a high spice tolerance, so make sure you know what you're getting into if you're thinking about buying some of this fiery turkey. I recommend trying a sample first. Follow-up: I just did a Google search and learned from its Wiki page that one of jerk seasoning's two main ingredients are Scotch bonnet peppers. This one's on me, folks. Lesson learned! Wow, I never knew Jerk seasoning was quite that spicy! Good to know! Haha, nice ... yeah, I think I'll get it again soon. It's no as spicy as I expected, but I am Jamaican so perhaps I'm just used to it. It probably does help to be Jamaican, which I'm not. I'm sorry to hear about the rectal bleeding, buddy. I get half jerk Turkey with half honey maple glazed turkey and it balances out great. Best ever! I taste a worstershire base for the jerk. Tammy - I followed your lead and got some honey maple and jerk turkey for a combo sandwich today. Delicious! It kept the spice from getting too overwhelming and I agree that it's a nice sweet/hot balance. Thanks for the tip! I think you've cracked the code to making the Boar's Head jerk turkey manageable. Now you've inspired me to experiment with some other combos. I bet the honey maple turkey would go well with the Boar's Head Salsalito turkey and buffalo chicken, too. You are very welcome and have done worked me up for a publix sub today lol. Let me know how your combinations come out and i might give it a try.Thanks so much. It's not even remotely hot. If you can't take the jerk, don't ever get the cajun, 5 times more spicy. Both are excellent. Being that Big Condiment still seems to think Mustardayonnaise is a joke, I've been forced to seek out a suitable alternative. This search led me to Boar's Head's "Pepperhouse Gourmaise" spread. According to Boar's Head, Pepperhouse Gourmaise is "real mayonnaise with a touch of Boar's Head Deli Mustard and a house blend of black, white, pink and green peppercorns." They also claim that it goes well with poultry, beef and pork. I can confirm that it goes well with poultry and pork (or at least ham — I haven't tried it with any other pig-meats). And the quality of the ingredients seems to live up to Boars Head's high standards. As a black pepper kind of guy, I'm impressed by their fancy pink peppercorns. After years of waffling, I finally took the dive and purchased a bottle of Kewpie mayo. Kewpie mayo's premium price and disturbing packaging had previously prevented me from buying it, but Grub Street blogger Ian Knauer's Flavor Ammo post about it convinced me to give the baby-themed mayo a chance. For the unfamiliar, Kewpie is a popular Japanese brand of mayonnaise that's often found in gourmet specialty stores, such as Eastern District in Greenpoint, Brooklyn. It's also currently available for 10 bucks on Amazon. The package features a standing baby that could easily serve as a homicidal doll in a horror story. Adding to the unease brought about by the package, the mayonnaise comes in a bag. I can't be alone in my belief that a bag is a completely inappropriate container for mayonnaise. bears news "betrayed by nature"
It's What's Between is one of the internet's top sandwich-themed websites. We determine which sandwiches are best, and make sense of the ins and outs of sandwichdom.